Traditional medicine is a global system of remedies having its special theoretical rules as well as its own procedural experience. The practice of traditional medicine has been recognized as the only given alternative for a proper health care system prior to the discovery of modern medicine. This practice has been popularly characterized as being relatively safe in comparison to conventional medicine and moreover effective. One of the highly acclaimed medicinal plant families is the Scrophulariaceae family, offering a gracious mine of species familiar in traditional medicine for the alleviation of many health disorders. 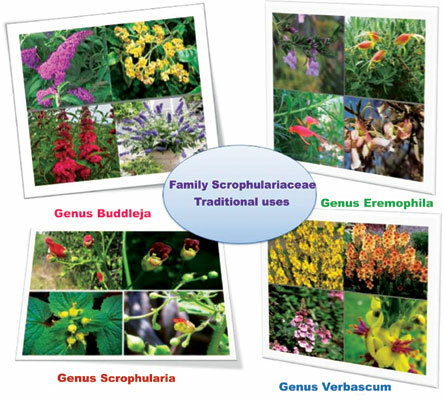 In this review, a collection of previously reported literature concerning the traditional importance of some popular genera belonging to the Scrophulariaceae family namely Buddleja, Eremophila, Scrophularia and Verbascum is presented. Emphasis is not only made on the traditional medicinal value of these genera, but also further support of the ethnic claims is presented by recent biological and pharmacological evidence based studies on certain species. Traditional uses, Scrophulariaceae, Buddleja, Eremophila, Scrophularia, Verbascum.